Pillayan alias Sivanesathurai Chandrakanthan, who is second in command of the Tamil Makkal Viduthalai Pulikal (TMVP) claims that there is no split between him and his leader Karuna Amman. The one time LTTE cadre who had taken part in several battles against the Security Forces in the past says that the leadership of Prabhakaran will not bring any relief to the Tamils and he would continue to be arrogant not accepting any constructive settlement to the Tamil question. In an exclusive interview with the Sunday Observer, Pillayan speaks in detail on the decision taken by Karuna and his other colleagues in the East to keep away from the clutches of Prabhakaran, who according to Pillayan is an arrogant dictator. Q: How do you describe the functions of the Karuna faction? A: First of all I would like to say there is nothing called Karuna faction. Our party is known as the Tamil Makkal Viduthalai Pulikal (TMVP). We are committed to find a meaningful and a durable solution to fulfil the political aspirations of Tamils in this country. On the other hand we are also determined to defeat terrorism which is a major obstacle for the integrity and the socio-economic development of this country. Q: What has really gone wrong with Karuna who is now in UK? Is there any split between you and Karuna? A: There is no split between our leader Karuna Amman and us. There were all made up stories saying that our party members were clashing with each other and we are in disarray. There is no truth in those stories. I played an important role in establishing our party. Therefore from the very beginning I was entrusted with the powers and responsibilities as the second in command next to my leader.So as my leader is now away from the country, I had to take over the party's responsibilities. However certain elements are trying to tarnish our party's image by carrying out a false story. Our organisation has been created on democratic principles. Therefore we respect the freedom of expression of each member in our party. So arguments and counter arguments could be expected when the party men are allowed to express their views freely and this should not be interpreted either as a split or a conflict within the party. Of course there were delays in structuring our party. However we have done it successfully and now there is no room for any misgivings within the party. Q: How long were you engaged with the LTTE? And what made you to join the LTTE in the first place? A: I joined the LTTE at the age of sixteen in 1991 at the time while I was schooling. There were many like me who joined the organisation, thinking that only through military means we could achieve our political goals. So, we didn't see anything abnormally wrong in that particular period by joining the LTTE. Q: What made the Karuna faction to go separate ways from the leadership of Prabhakaran? A: In fact the main reason for us to wriggle out from the leadership. He was going ahead with terrorism under the banner of freedom struggle to reach an unattainable thing called a `separate Tamil state' which is a myth. Prabhakaran rejected all good efforts put forward to find a political solution to the Tamil people in the country. The LTTE leader has made thousands of youngsters to sacrifice their lives for his dictatorship. Therefore we decided to keep ourselves away from a person who is single minded and not bothered about the peaceful existence of our people. So, we realised it was meaningless to remain under the leadership of Prabhakaran and quit the LTTE in order to protect our people. Q: Karuna was known as the right hand of Prabhakaran and why he decided to get away from Prabhakaran amidst the progress of the peace process? A: The cadres from the Eastern province were closely monitoring the then peace process and were hopeful of reaching an amicable settlement. We thought the war that could be ended and our people would lead a peaceful life. However Prabhakaran was not interested in reaching a peaceful settlement and went on raising funds and buying weapons to strengthen further his outfit during the Ceasefire period. So we found it was meaningless to remain in the LTTE and decided to get out of it. Q: Is there any more LTTE leaders who are dissatisfied with the LTTE leadership and waiting to give up arms? A: The LTTE is now terribly weakened and their key commanders are highly demoralised. They cannot think of going forward and engaging in big operations. They are also weak in defending the areas where their presence is felt. The fall of Thoppigala highlighted their inability in safe guarding their stronghold areas. The present day commanders of the LTTE feel that Prabhakaran and his intelligence chief are responsible for the downfall of the LTTE. Q: What do you think about the government taking control of the LTTE held areas in the North and East, particularly, the capture of Thoppigala the strong hold of LTTE in the East? A: We appreciate the efforts taken by the Government in liberating the innocent civilians from the clutches of the LTTE. It is the utmost responsibility of the Government to liberate the people from the grip of the terrorists. On the other hand we like to emphasize that the civilians who have been liberated from the LTTE should not be harassed under the civil adminstration of the Government. Their basic facilities must be looked into and all support must be given for them to resume their normal life without any interruptions or intimidations. Q: What are the main battles that you have taken part in the past against the Security forces? A: When I was a member in the LTTE, I took part in almost all the important battles that took place in the East. And in the North I was very much engaged in challenging the `Jayasikuru' military operation. Q: What is the fate of the Cease Fire Agreement? A: First of all we denounce the Ceasefire Agreement. The LTTE leadership used the opportunity it gained through CFA to hunt down the key political and the military figures. So we consider the CFA period gave ample opportunity for the LTTE to go ahead with it covert activities. Of course the CFA brought some relief to our people. But everything went upside down with LTTE violating the agreement. Q: How do you see the Tamil National Alliance (TNA)? A: The emergence of TNA was considered a political arrangement to address the grievances of the Tamils politically. Let the TNA Parliamentarians speak to their conscious whether they were able to do anything meaningful to our people. They are deceiving the people they represented and putting them in more troubles by taking orders from Wanni. Q: Will your party agree with other political parties opposed to the LTTE functioning in the East? A: We invite all political forces to stand against the LTTE terrorism. Our party is prepared to join hands with the political parties which are genuinely interested in working towards fulfilling the political aspirations of our people. Instead of taking our people for a ride by giving false promises, we urge the Tamil parties to face the realities and look forward in finding a peaceful solution for our people without further delays. Q: How does the TMVP see the military operations under the Mahinda Rajapaksa government to crush the LTTE? A: We appreciate the bold initiatives taken by the Government to defeat terrorism. The people in the North should also be liberated from the LTTE like the people in the East were liberated. Unlike the previous regimes the present Government is all out to root out terrorism. However the rulers should ensure that the innocent civilians are not harassed in the war against terrorism. While taking the tougher stance against terrorism, the rulers should also expedite the peace process to find a political solution. Q: What is the strength of the LTTE in Wanni? A: As the LTTE has been in Wanni for a long period their whole strength has been accumulated there in a big way. Therefore capturing the region won't be an easy task. Anyway, if an offensive is launched to take control of Wanni the LTTE could only go ahead with defensive attacks and they won't be in a position to initiate fresh attacks to re-capture the places they lost to the armed forces so far. Q: Will your party help the security forces in case of a military offensive in Wanni? A: The Security Forces need not to get our assistance in case of an offensive in Wanni. The strategies of the present Security Forces' Chiefs and the Defence Ministry show that the LTTE will soon see its `waterloo'. Q: How come the LTTE has encroached into Yala? A: We believe that the LTTE cadres who escaped from the East when the military operations were carried out there and the cadres from the North would have also now infiltrated into Yala jungles. They could have gone into Yala through Kumpurupitty, a border village in the Trincomalee district and through the border areas of Ampara region. 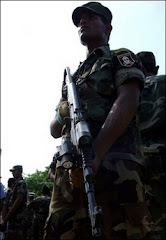 The LTTE has adopted the tactics to deviate the attention of the Security Forces in the North by making their presence in Yala. Q: What do you think about the recent victories of the Navy in destroying more than 10 LTTE ships in the Eastern waters? A: The recent victories of the Navy in the seas against the LTTE are remarkable and historic as the destruction of LTTE vessels has helped in a big way in smashing its supply routes and preventing its gun running activities. Q: Still there is an allegation to the TMVP that you are recruiting children and adults forcibly. What is your comment? A: We need not to conscript the elders or the infants into our party. Our military strength is limited. As we are now in a position to defence ourselves we don't expect the children to carry arms for us. Of course we had some under-aged cadres with us. It was after their security was ensured we have handed over them to their parents as well as to the UNICEF. Q: What is your expectation in finding a durable solution to the Tamil issue? A: We have committed ourselves to find a meaningful and a durable solution to the Tamil question in the country. The other parties should also come forward in doing their part in creating peace and harmony in the country.